Maschinen-Mensch Forums • View topic - Translate into Chinese.Huge Project! this topic uesd for note translation process.i wish i can finish it. Re: Translate into Chinese.Huge Project! Hi guys. I join in the Gutenberg. And,this translation will finished by the Gutenberg. We will make a better translation. Project Gutenberg is a localization service volunteer organization for China, and we can provide FREE and HIGH QUALITY Chinese localization service for some good indie games such as The Curious Expedition. We will keep you informed of the progress made of the localization project here. You can also contact us via email: gutenberg@indienova.com. Great news! We'll look into implementing a chinese font as soon as possible. Let us know if you need anything else. JokerCao wrote: Hi guys. I join in the Gutenberg. And,this translation will finished by the Gutenberg. We will make a better translation. 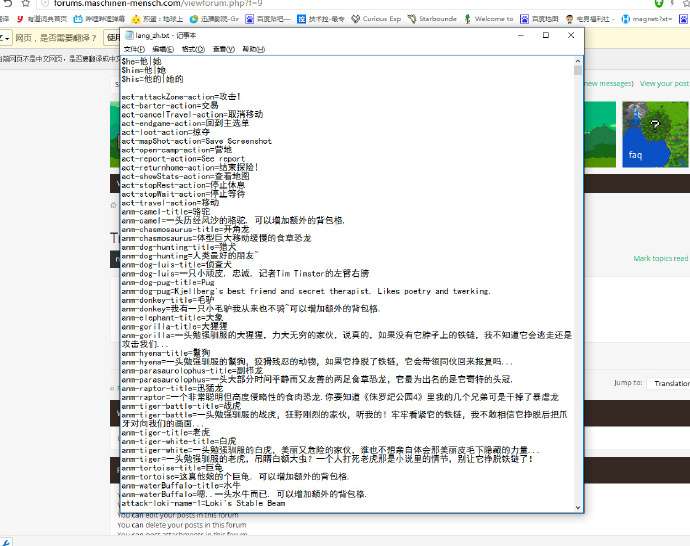 Don't see you back here in about 2 years, just wondering how is the Chinese translation project going on now? Has it been finished? Or is it still on-going? I've visited your team website and the concept is great (BTW do you need more Chinese translators to join your team). Keep up with the good works.